The Thomashefskys: Music and Memories of a Life in the Yiddish Theater premiered at Carnegie Hall in April 2005, with words and music brought to life for the first time in a century. The story’s lead characters are Bessie and Boris Thomashefsky, grandparents of Michael Tilson Thomas. 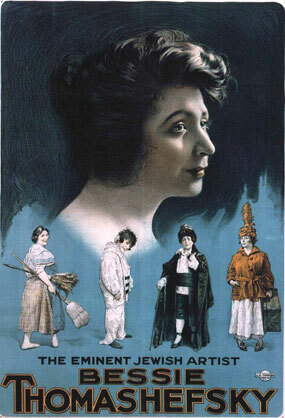 Bessie and Boris emigrated to the United States from Eastern Europe in the 1880s and, while still in their teens, began to play major roles in the development of American Yiddish theatre. For Jewish immigrants of the late 19th and early 20th Century who settled on the Lower East Side of Manhattan, the Yiddish theatre was central to their lives. It replaced touchstones of Eastern European life - the village marketplace, the temple, the rabbi - and provided a stage for the new ideas that were shaping the psychological, emotional, moral and educational transition to a new, American way of life. In The Thomashefskys, Michael Tilson Thomas serves as guide through the lives and repertoire of his grandparents. His grandfather died before he was born, but his grandmother lived until he was seventeen. His close relationship with her and many of her colleagues is a source of much of the material in the performance. "My grandparents became mega-stars," says Tilson Thomas, "and found themselves smack in the public eye. They were subject to adulation and relentless scrutiny. Legions of crazed fans were obsessed with every detail of their work and their lives. It was a far cry from the simple Jewish family life in the Ukrainian villages of their origins. In the old country, there was already an answer to every question. Now, in a new land of total freedom, new unimagined questions were waiting around every glittering corner. "They wanted to use their theatre to explore these new questions and serve as a forum to search for possible answers. I marvel at what they attempted and how well they succeeded, from the classics to avant garde dramas, to original productions based on current events and contemporary Jewish life." At the height of their influence they owned theatres in and out of New York, published their own magazine, The Yiddish Stage, wrote columns in the popular Yiddish newspapers of the day, sponsored and encouraged new generations of young artists, brought uncountable numbers of Yiddish artists to the United States, tirelessly raised funds for progressive social causes and, through it all, were adventurous trend setters. The end of unrestricted immigration and changing tastes of the first-born American generation caused the diminishing of their world. Nevertheless, in 1939 the New York Times reported that 30,000 people lined the streets of the Lower East Side on the occasion of Boris’ funeral. Bessie lived on until the early 1960s and, from her Hollywood Hotel, wryly witnessed the rises and falls of show business legends. Tilson Thomas shares the stage with a 30-piece orchestra and four principal performers who bring the repertoire and words of Bessie and Boris to life. All the material is authentic, researched and reconstructed by The Thomashefsky Project. The Project was founded in July 1998 in order to rescue the story of the Thomashefskys and early American Yiddish theatre’s contribution to American cultural life. Through its work, many disintegrating scores have been located and preserved to recreate as true a version of the original works as is possible. These reclaimed musical treasures present audiences with a musical sound that few have heard, integrating aspects of Eastern European klezmer and cantorial modes with American tones and rhythms. With time these components became more integrated and more American, as Eastern European Jewish composers became more engrossed in their new surroundings, greatly influencing composers like Irving Berlin and George Gershwin. A range of musical numbers performed in the show reflect this new, increasingly American, musical sound. Film clips and projections of archival photographs, posters and other memorabilia enhance the telling of this uniquely American tale.